Ready to test your imagination? 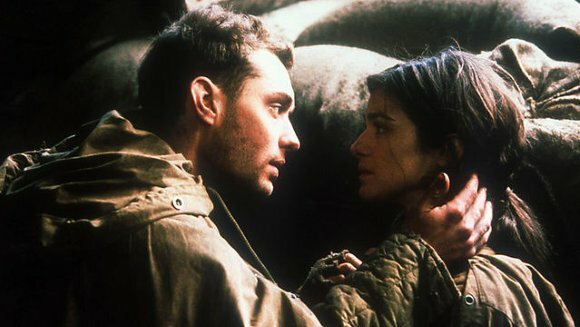 Picture Jude Law as a Russian shepherd-turned-sniper. Then imagine Ed Harris as a sinister German Nazi. Yeah, Enemy at the Gates, a new film by Jean-Jacques Annaud, asks you to suspend your disbelief with all of your might. We see several familiar Hollywood stars as characters of foreign origins, in an area of the battle where the U.S. never becomes a presence onscreen. This is going to be a problem for some moviegoers — especially as the film makes its way around the world. But there’s nothing quite so incongruous as, say, John Wayne as Genghis Khan. Fortunately, the actors are quite compelling. Bob Hoskins hams it up as Nikita Kruschev, and Joseph Fiennes plays a socialist political officer. For the most part, the actors do not strive to appear Russian, German, or anything foreign. They do not use strong accents. Their avoidance of these “serious acting” conventions seems to emphasize that this is, indeed, a fiction, very loosely based on a true story. I liked this choice. It kept me to get over the strangeness early and focus on the true story. That true story, to the best I can gather, is that there was a shepherd in Russia named Vassili (Law) who became a sniper, and that sniper became something of a hero who inspired troops during the long and terrible battle for Stalingrad in 1942. Legend has it that the Nazis sent a special sniper named Konig (Harris) to specifically try and shoot down this famed farmboy gunner in order to dishearten the socialist forces. The good news is that Annaud finds room in this story for some fantastic, suspenseful sequences. The bad news is that he shoves in a love triangle melodrama that feels forced and awkward. In the opening scenes of the film, we are shown Kruschev’s forces running to certain death into heavy Nazi activity. When they turn back, their own forces shoot them for being cowards. A political officer named Danilov (Fiennes) discovers Vassili’s incredible skill during this gory, stomach-turning sequence. Later, when he stands among those being reprimanded for the losses, Danilov is challenged by Kruschev to come up with a plan to boost the spirits of the failing troops. “We need heroes,” he insists, striving to provide an idea to encourage the men. “Do you know any heroes?” Kruschev asks. “I know one,” he says. And so he begins to manufacture a mythos around Vassili and make him a hero. Thus the movie seems to settle in on a question and a theme: What makes a hero? Secondarily, there is this question: Must a hero be perfect? Can he be flawed? Danilov is taking advantage of Vassili’s skill to forward his own reputation with Kruschev. He likes Vassili’s skills, but considers this hotshot shepherd boy to be a lesser being because of his poor education. When a lovely young Jewish woman in fatigues (Rachel Weisz) shows up on the scene, both Danilov and Vassili are smitten. Danilov is determined to win her by emphasizing his higher intellectual status, but of course, it is Vassili’s simple-minded determination and skill that wins her heart. He’s the one who’s exhibiting bravery, while Danilov hides behind selfish and egotistical excuses. Meanwhile, Vassili’s fame spurs Nazi retaliation — a sinister German sniper named Konig (Ed Harris) comes looking for him, and a battle of cleverness and precise shooting is under way. After Vassili gets advice from a seasoned veteran (Ron Perlman in an over-the-top, amusing performance), we watch him crawl through ruins, through pipelines, and under the mountains of dead bodies in search of an open shot. Annaud shows a real knack for hold-your-breath suspense here, enough to make me hope he will do more action-adventure in the future and leave soppy epics like Seven Years in Tibet behind. It is also refreshing to see a war hero that isn’t a cookie-cutter, flag-waving American crying “Freedom.” Law plays Vassili as an uneducated, frightened, insecure human being who earns our respect by enduring difficult pressures, demonstrating patience and discipline, and doing what he can to provide an example of valor for his disillusioned countrymen. He isn’t driven by personal revenge. He isn’t some silhouetted icon of myth and legend. He does his job because he wants to be a responsible soldier. And his opponent, Konig, is not just a cold, calculating cartoon, but a human with flaws and personal grief, striving to conceal his wounds. Watch how Harris portrays Konig in the inevitable final confrontation. It’s not your typical showdown. It is a memorable moment between two human beings who know each other as well as they do their fellow soldiers, even though they have never met. I was also impressed at how the film could show the redeeming qualities of Vassili without glorifying his socialist cause. Near the end, a key character suffers a breakdown of faith in his own socialist philosophy, and thus, not having a defined political side to root for, we are left only with individuals, their choices, their instincts for what is right. Vassili is not a killer at heart, unlike the reptilian Konig who demonstrates a rather psychotic fascination with the science of his murderous work. Vassili fights because he must, and because he pities the people and the troops around him. After all, these miserable socialist soldiers face a death sentence if they don’t fight and quite possibly another death sentence if they do. So Vassili, scared and almost beaten, gets up again and takes up his rifle to keep the dream alive, to fuel the rumors of his exaggerated hero status, to provide them with an inspiration, even as his own life is on the line. This is a complicated, unusual, and exciting hero. In spite of these impressive aspects of the film, I cannot fail to mention its weaknesses, which are few but obvious. It borrows rather heavily from Saving Private Ryan in its opening sequence, although it does so with effective ambition. Again we are made to feel the vulnerability and panic in these poor soldiers. But my biggest complaint with the film, as is often the case, is with its soundtrack, composed by James Horner. Horner could be sued for plagiarism in that the film’s main motif is almost a note-for-note copy of John Williams’s theme for Schindler’s List. Horner has made a career of cut-and-pasting soundtracks from other composers, especially Williams. It first got on my nerves when his theme for Willow turned out to be a boiler-plate trumpet anthem like the Indiana Jones theme, and it peaked in last year’s The Perfect Storm, where his music was so overbearing it actually spoiled the suspense of a rather amazing tempest at sea. A good soundtrack should subtly accent what is going on, like adding italics or underline to a sentence. Horner’s approach sometimes suggests that the movie is not good enough, that the music must pound the audience into submission. While his Enemy at the Gates score is more restrained than The Perfect Storm, it is still borrowing power from a better movie to try and elevate something that really needs no help at all.